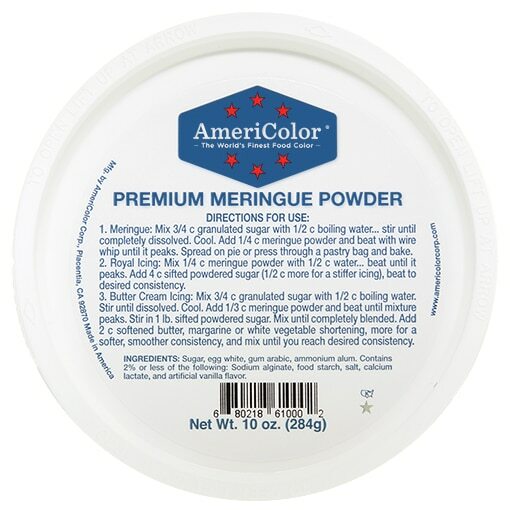 Premium Meringue Powder, 10 oz – AmeriColor Corp.
AmeriColor® Premium Meringue Powder lets you make light and fluffy meringue topping, royal icing, buttercream, macarons and boiled icing, and is the best way to get consistent results every time. When making royal icing, our Premium Meringue Powder runs in easily, produces a very white icing, and it won’t clog your tips! Follow the directions (included on the top) to create a fluffy buttercream, then adjust the mixture for a smoother or thicker texture. Like all AmeriColor® products, our Premium Meringue Powder is peanut and tree nut free. It smells good and has a great taste, too!